Start your day with a bowl of this Goji Berry & Coconut Granola packed with nutrient-dense ingredients like golden flaxseeds and sunflower seeds! Perfect layered with your favorite greek yogurt! 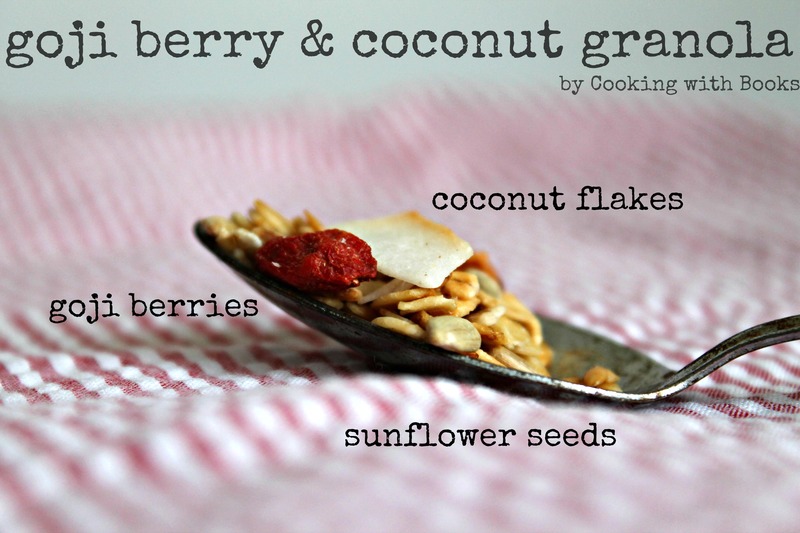 Put down the sugary cereals and exchange it for a bowl of my Goji Berry and Coconut Granola! Ok, ok. You can have your sugary cereal in moderation, but consider switching it up with this granola I created just for you. It’s packed with so much goodness and it tastes just as good! My Dad clued me into goji berries – it seems he’s addicted to them and always tells me to send him care packages with goji berries! Both my parents are health nuts: my mom knows the nutritional value of every nut, seed, and grain, while my dad will juice anything and everything. Oh and they both love finding ways to consume aloe vera, since we have a thriving garden packed with it. How do they use aloe vera? Here are just some ways: infused in water, blended into smoothies, slathered on your face after a sunburn, and even adding it to fruit salad! Now, about goji berries. Since I’m not a doctor, I looked up some benefits and am sharing here: They’re anti-inflammatory. They’re naturally vitamin rich. They protect your eyes. They promote muscle growth. They enhance immunity. Seriously, goji berries are awesome! Read more about them over at Vegetarian Times. Use this granola as a starting point and a way to use your favorite nuts, seeds, and dried fruit. Add chocolate chips and make this Coconut Granola by What’s Gaby Cooking. Add some pumpkin puree to make this Crunchy Pumpkin Spice Granola by Sally’s Baking Addiction. What’s your favorite addition to granola? Nutrient-dense and colorful, this granola is the perfect start to your day! In a small saucepan, melt the coconut oil and agave or maple syrup together. Drizzle melted oil and syrup over the rolled oats and toss to coat. Add flaxseeds and spread on a baking sheet. Bake oats for 15 minutes, or until golden brown around the edges. 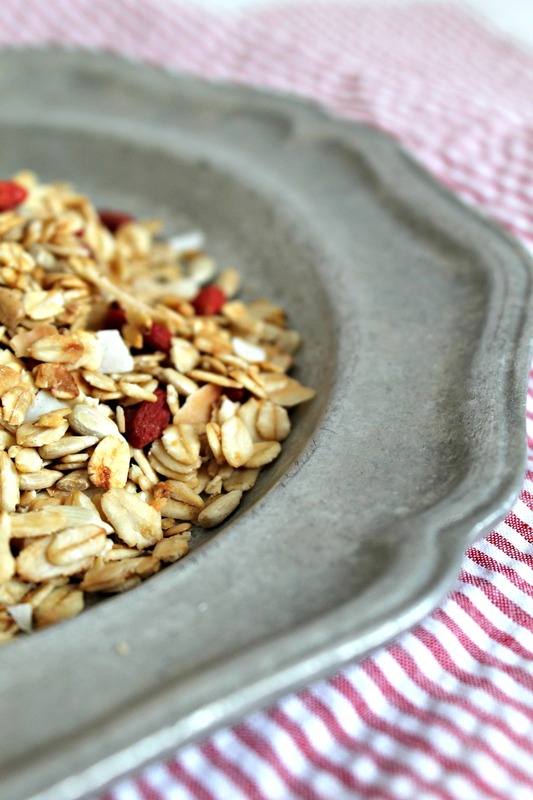 Toss toasted oats with coconut, goji berries, and sunflower seeds. Sprinkle with cinnamon and let cool. Store in an airtight container and serve with yogurt, over fresh fruit, or in a bowl of milk! You’re right, this would be amazing with some greek yogurt can’t wait to have this!